It is no surprise that I have a little bit of a ring obsession. I don’t really own a lot of jewelry but I have noticed that I have a bit of a ring collection going on so I wanted to share some of my favorite rings with you. When it comes to jewelry, or pretty much anything for that matter, I like simplicity and versatility. I want my rings to be able to go with everything and even though I like to wear a lot of rings all at once, I don’t want it to look like I’m wearing brass knuckles. With that said, I am very happy with the collection I have so far. Here are some of my favorite/most worn pieces. 1. This is one of my newest rings and it has already become one of my absolute favorites. It is a signet ring with a G engraved on it and I wear it on my pinky. 2. One of my favorite stones are opal stones so I really love this dual ring which has a white opal stone and a black diamond on top, I love how unique it is. 3. I love evil eye jewelry but sometimes I feel like they could be a little over the top so I love how subtle this evil eye ring is compared to others I’ve seen. 4. Love the black diamonds on this ring. I actually got this one here but I don’t see it on the site anymore but mejuri makes something almost identical. 5. I feel like everyone needs a dainty white diamond ring and this one is perfect by itself or stacked with others. 6. I’ve been obsessed with circular jewelry/accessories lately so I had to have this 360 ring in my collection, it is so simple yet makes such a statement. 7. 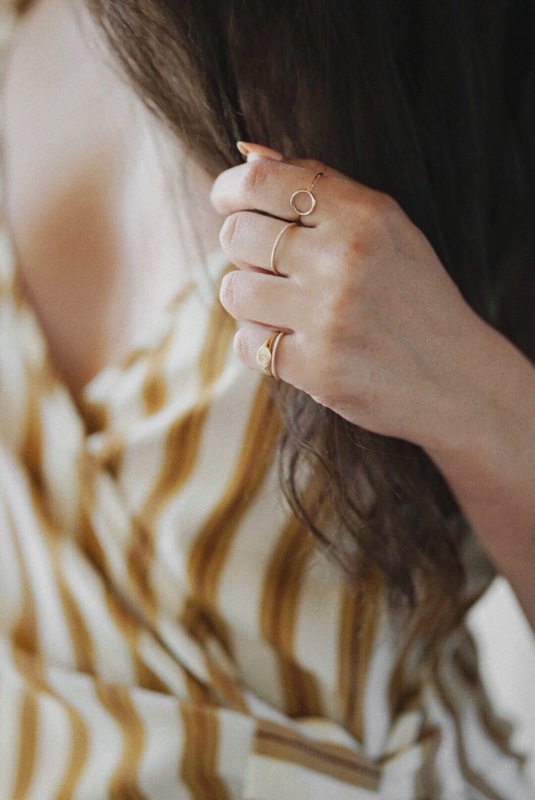 Everyone needs the perfect stacking rings and I have these from mejuri. I have a smaller size for my pinky and a larger size for my other fingers. 8. This is my only midi ring and I love how I can adjust it to fit almost all of my fingers. 9.This is another one of my favorite stacking rings but I also love wearing this one on my thumb or by itself. As far as quality, It comes down to how long you want your jewelry to last. I have dabbled in inexpensive jewelry purchases here and there and time after time the jewelry goes bad within months ( just my experience) so to me it is worth spending a little more on jewelry that is going to last. As long as you know that it is a classic piece that will not go out of style anytime soon or ever, I think it is worth spending a bit more. I don’t wear rings often, but this post makes me wish I did <3 All those rings are so cute! !